Pluscarden Abbey as we know it today owes its foundation to King Alexander II of Scotland in the year 1230. At the same time grants were made to two other sister houses, Beauly in Ross, and Ardchattan in Argyll. The community that served these churches was one of Valliscaulians, a little-known order that shared some of the strictness of the Carthusian discipline with the spirit of fellowship that existed among the Benedictines, and only at these three places was this order represented in Scotland or England. The parent house in France, the Priory of Vallis Caulium, had been founded just over thirty years earlier and the original brethren from France must surely have found in Pluscarden, an echo of their own situation, lying in a deeply wooded valley in Burgundy, nestling at the foot of a steep and densely forested hill. In fact an old name for the Pluscarden valley, the Kail Glen, is nothing more than a translation into Scots of the French Val des Choux or the Latin Vallis Caulium. Apart from this link of geographical similarity, there is reason to believe that the site of Pluscarden had had religious associations long before 1230 and that a hermit's cell and a well dedicated to St. Andrew may have been situated here; and certainly the dedication of Alexander II's Priory was to the two patrons of the Order, St. Mary and St. John the Baptist, as well as to St. Andrew. However, despite its parental ties with France, the history of Pluscarden is very much concerned with Scotland's own affairs. The remoteness of its situation and the slender administrative links with the original foundation meant that the Priory went largely its own way until in 1345 when it came under the immediate surveillance of the Bishop of Moray whose seat at Elgin Cathedral had been founded also by Alexander II seven years before Pluscarden. Both before and after the change in ecclesiastical authority, the Priory buildings had suffered by attack. In 1303 the armies of Edward I of England had ravaged the Province of Moray and Pluscarden had suffered damage, but much more serious than this was the assault traditionally led by the Wolf of Badenoch in 1390. The powerful man, Alexander Stewart, illegitimate son of king Robert II, held the appointment of King's Lieutenant north of the Forth. But his judicial authority was disputed by the Bishop of Moray, and the long-standing quarrel between the two men came to a head in this fateful year of 1390 when the Wolf swept down from his Badenoch fastness' upon the coastal plain of Moray, firing the town of Forres, and the town and Cathedral of Elgin. It therefore seems probable that the Priory of Pluscarden, now under the Bishop's protection, was burned at the same time and today we can still see traces in the Abbey buildings of a fire of about the 1390s. The next date of significance in the history of Pluscarden is the year 1454. From its foundation until this year the names of eleven Priors are recorded as well as numerous grants of land, of mills and of fishing's on the Spey. But despite this apparent prosperity the decision was taken in 1454, probably for economic as well as political reasons, to unite the house of Pluscarden with that of Urquhart Priory, an ancient off-shoot of Dunfermline Abbey five miles east of Elgin, that could look back in history a whole century before Pluscarden. Administratively, the Urquhart brethren transferred to Pluscarden and ecclesiastically, this date marks the disappearance from Moray of the white habits of the Valliscaulians and their replacement by the black dress of the Old Benedictines of Dunfermline and Urquhart. More than this, we can detect the influence of Dunfermline today in the characteristic design of certain later windows and other details in the monastic buildings as they survive. After this union of the two houses, a further seven Benedictine Priors bring us up to the last: Alexander Dunbar, Prior of Pluscarden from 1533 to 1560. Dunbar, like his contemporary and neighbour, Patrick Hepburn of Elgin Cathedral, had the foresight to anticipate the events of the Reformation in Scotland and appears to have brought under his direct control Priory funds and Priory lands in favour of his own family. He died in the winter of 1560/61 but records show that some monks continued in decreasing numbers to inhabit the Priory buildings until almost the end of the century, under the authority of the lay Commendator, Alexander Seton, Lord Urquhart. There now ensues a long period of eclipse in the religious history of Pluscarden. As a lay property it passed through various hands; in 1594 Lord Urquhart sold the lands to Kenneth Mackenzie of Kintail, a Privy Councillor of King James VI, and the estate remained with the Mackenzies for seventy years. In 1662 it passed to the Brodies of Lethen, a neighbouring family and from them to the family of Duff who eventually became Earls of Fife. In the obscurity of these centuries of domestic change we get occasional glimpses of light: Alexander Brodie records in 1680 how he went to Pluscarden at night: "we went thorough' that old ruined Palace and did see the vestiges of a great old building and edifice"; and seventy years later there is a tradition that an old Mrs. Gordon of Westerton used to go alone, save for a serving girl, to the Priory ruins and worship privately there. At one point in the 18th century, former granary buildings near the East Gate, once called the Old Ha, were used for local worship and in 1821 Lord Fife carried out some alterations in the original calefactory of the Priory Church to make that apartment suitable for use as the local Free Church. Finally, parts of the Priory Church continued to be used as a burial place by local families. Apart from these moments of occasional activity, the Priory buildings stood unmaintained against the weather; roofs collapsed and ivy grew upon the walls, woodwork rotted into mould and rubble accumulated in the church and cloisters where once the monks had walked. Life started again for Pluscarden in 1948. The property had passed in 1897 from the Earls of Fife to the third Marquess of Bute and form him to his son, Lord Colum Crichton-Stuart, and it was he who in 1943 gave the Priory and its land to the Benedictine community of Prinknash, originally an Anglican Benedictine community who were received into the Roman Catholic Church as a community in 1913. The Marquess of Bute had already put in hand the work of preservation, but following the re-establishment of the Benedictines at the Priory more ambitious restoration was commenced. The community were able to take up residence there by 1948 and seven years later the central tower of the church had been roofed and the bells of Pluscarden once again rang across the valley. 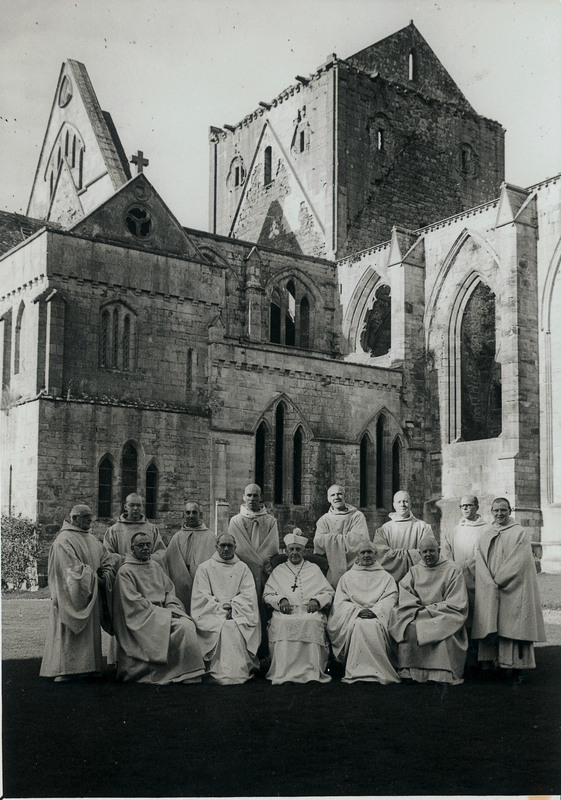 Independence was granted in 1966 and in 1974 the monastery was elevated to the status of an Abbey. The story of Pluscarden is by no means finished. Today we see it as a thriving house, a training place for Novices and a place of worship, work and reflection. The physical labour of re-building goes on and when time and funds permit, we shall eventually see a monastery restored to its former glory yet fitted as a religious house of the twentieth century.